Abstract Body: White matter tracts of the human brain undergo differential developmental trajectories from ages 5 to 30. Previous findings demonstrated that the inferior longitudinal fasciculus (ILF) and the inferior fronto-occipital fasciculus (IFOF) in individuals with developmental prosopagnosia (DP) differ from typical adults, suggesting the integrity of these tracts is important for face perception. Yet it is unknown if the development of these fiber tracts relates to visual perception. We thus collected diffusion-weighted MR data , using diffusion tensor imaging (DTI) in 13 children, 11 adolescents,, 9 typical adults, and 7 atypical adults with DP. We extracted association fascicles connecting the occipital to the anterior temporal (ILF) and frontal (IFOF) lobes, as well as fascicles of low-level visual areas across the left and right occipital lobes. We measured white matter properties (fractional anisotropy, FA) and correlated them with subjects’ performance on the Benton face perception task. to measure white matter tracts. We deterministically tracked visual association fibers connecting the occipital lobe to the anterior temporal lobe (ILF) and to the frontal lobe (IFOF), as well as visual fibers connecting low-level visual areas across the left and right occipital lobes as a control (occipital forceps major, OFM). We measured the white matter properties of these tracts across age groups. Then, we correlated the resultant fiber properties (fractional anisotropy, FA) along the length of these fiber tracts with subjects' performance in the Benton face perception task. We observed prolonged development at focal points of both the ILF and IFOFalong the ILF and IFOF, with FA significantly different in children and DPs compared to adults (Fs > 3.3, Ps < .0008). Behaviorally,Face perception correlated specifically with ILF’s FA values in adolescents and adults, (Rs > .82, Ps < .004, Bonferroni corrected). We used LIFE (Linear Iterative Fascicle Evaluation; Pestillli et al., ISMRM 2013) and computed measures of data quality to show that the observed group differences are not due to either signal-to-noise ratio or reliability of measurements. Finally, we used a novel analysis of fiber tracking quality with Linear Iterative Fasicle Evaluation (LiFE) and found no significant differences across age groups in either signal-to-noise ratio, or reliability of measurements. These findings demonstrate that high-level visual fasciculi undergo prolonged development and that the structural integrity of the ILF is important for proficient face perception. A failure of white matter specialization in the ILF is a potential underlying factor in developmental prosopagnosia. Lay Language Summary: Our findings reveal that white matter_the fibers that interconnect regions of the human brain like wires of a computer_are not just passive carriers of information, but undergo dynamic development from childhood to adulthood, which can predict an individual’s ability to perceive a face. Consequently, maldevelopment of these fibers may underlie the condition known as face blindness. Vision is an incredibly complex facility of the human brain, one aspect of which is the ability to rapidly perceive and recognize faces. Face perception is a critical component of human social interaction. It is estimated, however, that about 2% of the adult population suffers from developmental prosopagnosia, also known as face blindness, where an inability to recognize faces often results in social difficulties. A large body of research has documented that face recognition abilities develop from childhood to adulthood, reaching adult-level performance in the late teens. While it has been shown that clusters of neurons at the surface of the brain may be responsible for this development, how changes in the white matter that wires up this visual network affect your ability to recognize faces has not been extensively examined. To determine if white matter development could predict improvement in face processing after childhood and whether or not this development has gone awry in individuals with face blindness, we measured white matter properties in school age children, adolescents, and both typical and face blind adults using diffusion-weighted magnetic resonance imaging - which enables measuring the brain wiring by measuring the movement of water in and along these fibers. 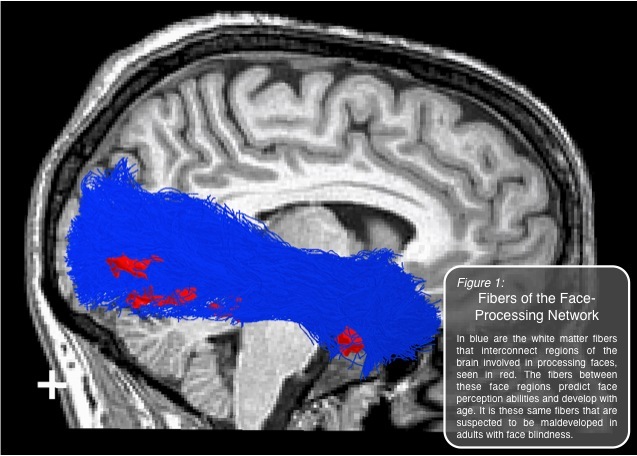 Not only did the properties of fibers interconnecting face-processing brain regions change progressively from childhood well into adulthood, but changes in their properties also significantly predicted individuals’ performance on a face perception task. Interestingly, this was not true for the face blind adults. Further striking was that despite being adults, face blind subjects had white matter properties that resembled those of children, suggesting that it may be a failure of the face-processing network to wire up through development that underlies face blindness. Even though it is the firing of neurons in the brain that allows the brain to compute information, our results demonstrate that the wiring of the brain has an important role in human vision. Indeed, we discovered that developmental changes in this white matter are essential for proficient face perception in adults. An inability to recognize and perceive the faces of friends and family, as is the case in developmental prosopagnosia, or face blindness, might be one condition resulting from white matter development that has gone awry. Future research from our lab will examine how both typical and atypical development occurs longitudinally over the period of several years. This will further illuminate how the brain learns to wire up and fire up as well as reveal factors that might prevent this process from occurring.